Various brand biological indicators provide the best assurance of sterility by challenging the steam sterilizer with quantifiable, highly resistant Geobacillus stearothermophilus spores and providing results quickly. Biological indicators are used for load control monitoring, which is the process by which a load is monitored and released based on the result of a biological indicator (BI) in a test pack. The 3M Attest system provides results within 48 hours. 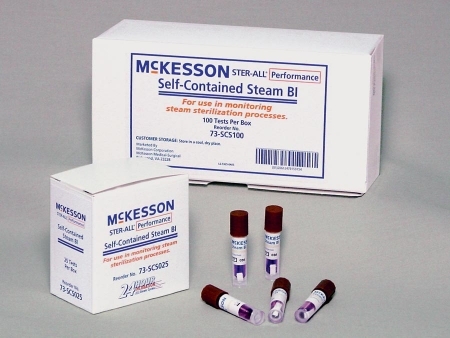 The self-contained BI for 250°F/121°C gravity and 270°F /132°C vacuum-assisted steam cycles consist of a Geobacillus stearothermophilus spore strip, sealed glass ampule with growth medium and a bromocresol purple pH indicator system, brown color-coded cap with holes for sterilant penetration and a filter as a bacterial barrier, and a chemical indicator on the label that changes from rose to brown when processed. After sterilization, the vial is "crushed" to join the growth media with the processed spore strip. The BI is incubated for 48 hours for a visual color change readout. A color change to yellow indicates surviving spores and a positive result. Store at USP controlled room temperature. Sold 25 vials per box. The 3M Attest system provides results within 24 hours. 3M Attest 1261 biological indicators for 270°F/132°C gravity steam cycles. Self-contained BI for 270°F/132°C gravity steam cycles consists of a Geobacillus stearothermophilus spore strip, sealed glass ampule with growth medium and a bromocresol purple pH indicator dye system, blue color-coded cap with holes for sterilant penetration and a filter as a bacterial barrier, and a chemical indicator on the label that changes from rose to brown when processed. After sterilization, the vial is "crushed" to join the growth media with the processed spore strip. The BI is incubated for 24 hours for a visual color change readout. A color change to yellow indicates surviving spores and a positive result. Store at USP controlled room temperature. Latex-free. Sold 100 per box. Ster-All Performance Self-Contained Steam BI is for use in monitoring 60-degree celsius steam sterilization processes. Final readout takes only 24 hours and fits in existing incubators. Latex-free. Sold 100 tests per box. Ster-All Performance Self-Contained Steam BI is for use in monitoring 60-degree celsius steam sterilization processes. Final readout takes only 24 hours and fits in existing incubators. Latex-free. Sold 25 tests per box. The 3M Attest system includes rapid readout biological indicators, disposable test packs, an auto-reader, and log books. 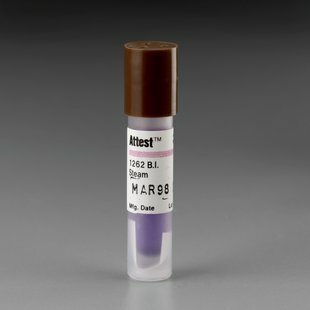 3M Attest 1291 rapid readout biological indicators for 132°C/270°F gravity displacement cycles. Self-contained BI for gravity displacement cycles consisting of a Geobacillus stearothermophilus spore strip, sealed glass ampule with growth medium and dual indicator system, blue color-coded cap with holes for sterilant penetration and a filter as a bacterial barrier, and a chemical indicator on the label that changes from rose to brown when processed. After sterilization, the vial is "crushed" to join the growth media with the processed spore strip. The BI is incubated for 1 hour in the 3M Attest 290 series auto-reader for a fluorescent reading. Note: This product must be used with Cat. No. 290 3M Attest auto-reader. This product is latex-free. Sold 50 per box.